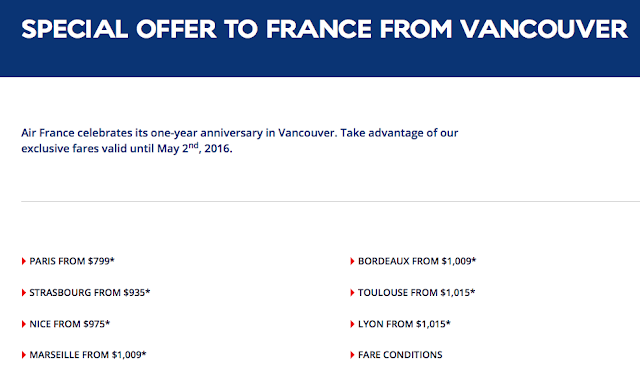 Rewards Canada: April 28 Update: BMO Rewards World Elite adding supplementary card fee, Air France celebrates 1 year in YVR, Best Western Rewards contest! April 28 Update: BMO Rewards World Elite adding supplementary card fee, Air France celebrates 1 year in YVR, Best Western Rewards contest! Rewards Canada reader Jeff W. alerted us to some negative changes coming to the BMO World Elite MasterCard. As of June 10th supplementary cards will no longer be free. Each additional card will cost $50. Ouch! Also if you are inactive with the card for 12 months they'll charge you a $10 inactivity fee! Seriously if you aren't going to use the card for a year you probably shouldn't have it seeing that you have to pay at least $150 for the card! Granted some may have it just for the insurance or get the card free with one of the premium BMO accounts and they'll have to make at least one purchase every 12 months, not a big deal but still. But back on the card annual fees, the other cards that BMO competes with either have a $150 annual fee with no fee for supplementary cards or $120 annual fee and $50 for the supp. This now makes the card on of the most expensive in the Infinite/World Elite categories with only Infinite Privilege and some other high end cards costing more. I'd have to say I am a little disappointed with this move by BMO! You can find out more about the changes here. A great contest from Best Western Rewards could get you the chance to win 100 free nights at any Best Western Hotels Worldwide! Sorry Quebec not open to you like most contests out there. Find out more here.